Fishing in Fort Myers and Sanibel is warming up because it’s the time to really enjoy the back country flats of Southwest Florida. The Fishing around Sanibel Island is as hot as a Jalapeño sandwich. 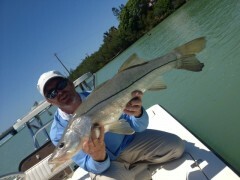 I love to Snook fish and it’s no better time than May. Still catch and release (quite frankly I’d love for it to be catch and release year round) but man are they fighting! It seems like they’re stronger than ever. Every fish I’ve missed the size judging by the fight. The back country Trout fishing has slowed because of the warming waters and the Redfish has calmed a little. The big draw now is the Tarpon. We’ve seen some decent numbers and many fish caught. As the waters keep warming the fishing should get better and better. Book a trip and experience the thrill of a lifetime.